"Everything is going to be ok, we can do it!" For weeks, Greek Prime Minister Alexis Tsipras has been spreading positive vibes about the state of his country's economy. In the context of the looming Eurogroup meeting of the bloc's finance ministers on Friday, it's easy to understand his need to be optimistic. But for ordinary business people in Greece, it's a different story. Ten years ago, Tassos Iossifidis left behind a life in Berlin to return to his home town of Thessaloniki in the north of Greece. Today, the 55-year-old runs a small restaurant in a popular city center nightlife district. He is busy, but still finds it hard to keep his business afloat. "The economic situation here is anything but rosy, however they want to spin it," he says. With Greece's latest bailout due to expire this August, there may be some form of fiscal relief in the near future but for small business owners, the crisis is far from over. "The only genuine success story is the Greek tourism industry. With 34 million tourists coming to Greece this year, that is truly a huge financial recovery," says Iossifidis. It's the presence of these tourists alone that is stopping Iossifidis from returning to Germany, he stresses. A business reliant on Greek customers only would not survive. The natives may like the food on offer, but they are a lot less keen when they see the prices. "My prices are too high for locals and I'm told as much." Tassos Iossifidis lays the blame for the misery at the door of his countrymen and women. "There is no trace of the noble values of Greek antiquity left today," he says. "Today's Greeks need to learn again what fairness, co-operation and confidence in business means." The restaurant owner has faith that the situation will improve if corruption in politics can be eliminated. He regularly expounds the virtures of the German tax system to his guests. That's because at home, he has been feeling the pain of tax increases recently. It's not just a VAT rate of 24 percent that hurts; the total tax burden on his business is over 40 percent, a figure which often keeps him from turning a profit. Iossefidis can't predict the future. At the moment, his 17 employees are only guaranteed work during the summer months, when tourism flourishes in the city. "Tourism is as sensitive as a delicate China cup," he says. He has fears over the possibility of the migrant crisis reoccuring, something which he fears would keep tourists again once again. Businessman Giorgos Tsiakmakis (main picture) confirms that view. He believes that what Greece needs now is prudence and patience. The 67-year-old hardware store owner is staying optimistic. He has been able to keep his business going because he owns it himself. His two children are unemployed and now he is introducing them into his own business, hoping that one day they can make their own fresh start in Greece. "If I had to pay rent, I would have given up a long time ago," he explains. "Business is not the best," he says. "At the moment, it feels like it's in the freezer." What the experienced retailer means is that quite simply, there isn't much money going around. People are not buying much these days and when they do buy, they want to negotiate downwards. On top of that, they are not using credit, relying instead on cash and debit cards. Buying on credit, like many did in the past, just can't be done anymore. "After the recent threat from Turkey, people have become more careful with their money," Tsiakmakis says, referring to recent tensions with Greece's eastern neighbour. Yet he has more faith in the negotiating skills of the current government than he had in previous ones. He's not the only one. Despite the difficult situation many ordinary Greeks find themselves in, around 80 percent of the population regard Tsipras as the most reliable and serious politician in the country. 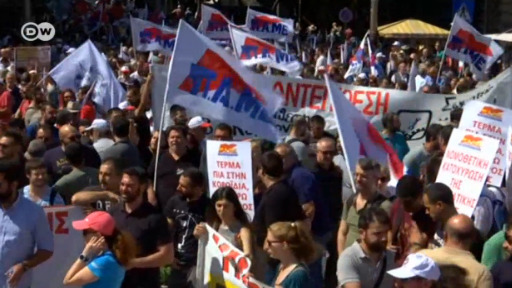 Tsiakmakis wants the country to avoid a premature election. "That would be the end for us, Greece still needs a lot of work to be done." For example, a central bank willing to lend to small and medium-sized businesses. "We need to fill our shelves again, because at the moment, everything we take in is spent on tax." Christos Kandas represents the younger generation of the country's business people. A computer and electronics specialist, he has run a shop for 10 years offering services in the installation of alarm systems and water filters. "The Greek national statistics may look ok, but basic income and living standards are falling," he says. "The result is we have to learn how to live with less." He says Greeks are tired of hearing how they got it all wrong. Kandas himself has no debts and he says a gap is emerging between businesses in terms of how well they are doing. "The strong become stronger and the weak become weaker, with the middle class gone altogether," he says. He also believes that the younger generation should invest more in the agricultural sector and less in modern technologies. In the end, what does it all mean? The economic data might look good on paper, but it will take time for that to be felt in any tangible way by the ordinary people of Greece. With more than 300 billion euros in rescue funds for Greece, the bailout isn’t just a success story for Athens but for the EU as well. From now on Greece will manage without an EU safety net. After eight years of aid, the financially troubled country appears to be on the road to recovery. Yannis Papadimitriou reports.